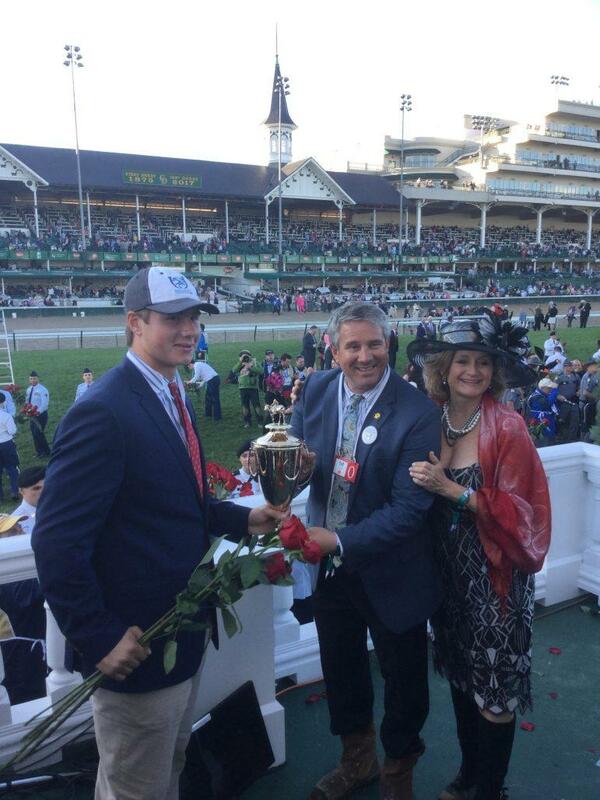 Jeff Lifson ’86 celebrates with his wife and son after his horse won the 2017 Kentucky Derby. Photo courtesy of Jeff Lifson. While the Kentucky Derby has been dubbed “the most exciting two minutes in sports,” most of the world sees little of the sport beyond that brief glimpse on the first Saturday of each May. For Jeff Lifson ’86, however, horse racing is a year-round job. Lifson, the executive vice president of the Midwest division of West Point Thoroughbreds, has spent almost the last 15 years of his career buying and selling racehorses. One of those horses, Always Dreaming, earned Lifson a prized trip to the Derby’s Winner’s Circle in 2017. While at the College, Lifson majored in history and played two years of football (“badly,” he quipped). At the end of his sophomore year, he transitioned to rugby, playing three seasons for the Williams Rugby Football Club. Upon graduating, he knew that he wanted to stay on the East Coast but was not sure what he wanted to do; he eventually took a consulting job with Bain and Company in Boston. Lifson did not stay in the consulting world for long, however. He attended graduate school at Northwestern, where he got his master’s in journalism, and became a television reporter. The switch in careers brought him to Louisville, Ky., where he discovered his passion for horse racing. Lifson took a job with the startup Television Games (TVG) Network, which he described as “the CNBC of horse racing,” as an on-air host and analyst. Fully immersed in the sport, Lifson began his work for West Point five years later in 2004. Lifson’s line of work requires him to attend public auctions, size up the competition and purchase the horses with the highest potential to perform. In some respects, buying and selling horses is similar to selling any other commodity in that large investments also bear large risks. Lifson warns, however, that those interested in buying a racehorse solely for the purpose of turning a profit should think twice. When it comes to looking for buyers, detecting a passion for the sport is key. When it comes to acquiring a horse at a public auction, there are a few key things buyers look for. Indicators of a strong contender can be found in data and biomechanics, which is why Lifson and his team look at stride analysis scans, the horse’s overall appearance (or “conformation”) and lineage when considering a purchase. Still, even the most educated of decisions have a degree of ambiguity. These limits to knowledge of a horse’s potential may diminish over time, however, with expanding access to genetic information. Whether these approaches are too intrusive, however, remains up for debate. One of Lifson’s main accomplishments at West Point was participating in the acquisition of 2017 Derby winner Always Dreaming. His company then sold shares of the horse to clients interested in partially owning a potential Derby winner. As far as the future of the sport is concerned, Lifson is interested in seeing how those within the industry can introduce horse racing to an even broader market using mobile technology. For now, however, the sport continues to be fairly unfamiliar to most. Nate Munson-Palomba ’21 looks to score upfield after catching an under during WUFO’s home tournament at Cole Field last weekend. Photo courtesy of Barron Koralesky.